It took more than ten years of working on the property, but the Four Horsemen have finally added their own brand-new character to Masters of the Universe. You can read the not-so-secret history of Draego-Man’s creation in this Fwoosh interview with Horseman Eric Treadaway last year, which describes the process behind his creation. 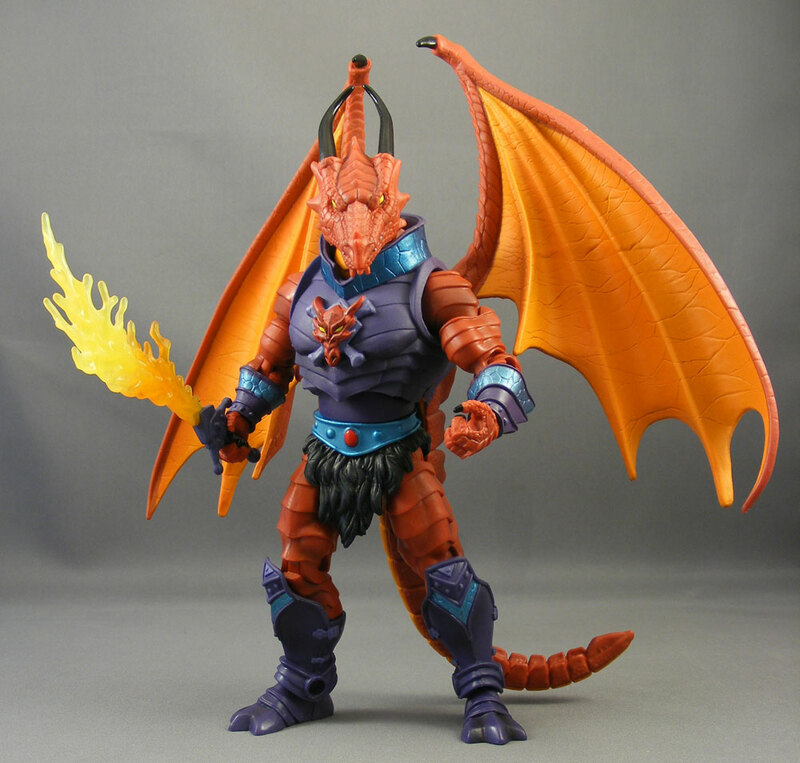 Of course, a dragon-man in MOTU is really a no-brainer – as Treadaway noted, it was odd there were no dragon-men in the original MOTU, nor any bad guys with wings. 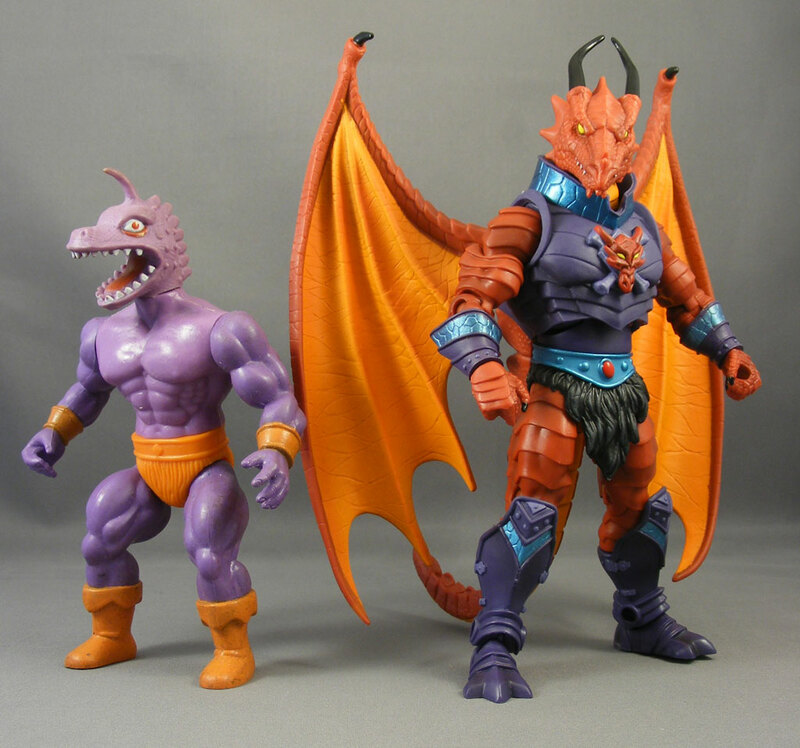 That said, Draego-Man has a very retro feel; he evokes memories of figures from those MOTU knockoff lines of the 1980s, like Dragoon from Sungold’s Galaxy Warriors, Gecko from Remco’s Warrior Beasts (pictured alongside Draego-Man below), Iguana from Sewco’s Galaxy Fighters or, most fittingly, Dragonman from SOMA’s Fantasy World. Of course, being a fantasy monster who fits in well with the ever-popular sword and sorcery interpretation of Masters of the Universe, Draego-Man has proven immensely popular amongst fans of all inclinations. So how is the figure? 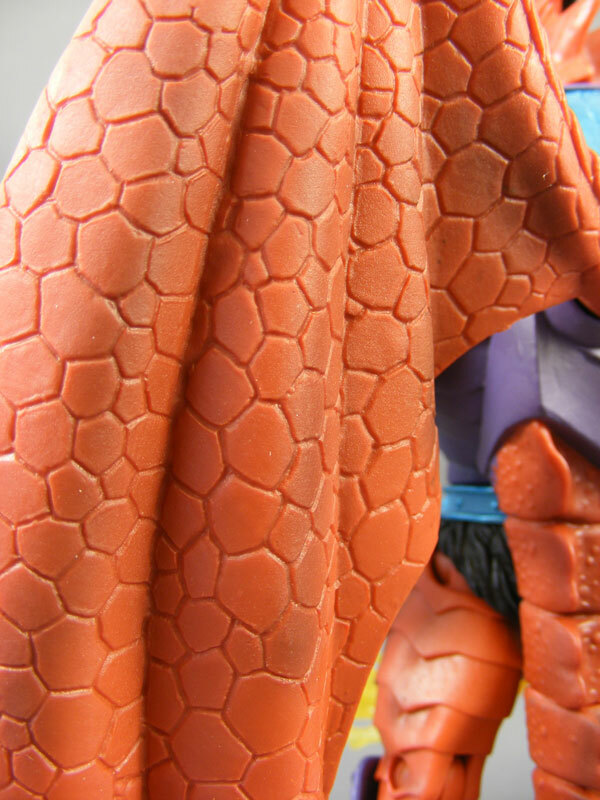 Design & Sculpt: Draego-Man is a masterful combination of new sculpting and existing parts. The new parts include the torso armor, wings, head, forearms and hands (though I suspect we’ll see the forearms and hands on a Snake Man at some point in the future, perhaps Rattlor). Otherwise, his thighs, biceps and shoulders come from King Hssss; his calves are from He-Ro; his feet and furry undies from Hordak; and his tail from Whiplash. The newly-sculpted parts are an example of what the Four Horsemen can do on this line when they’re given full reign. 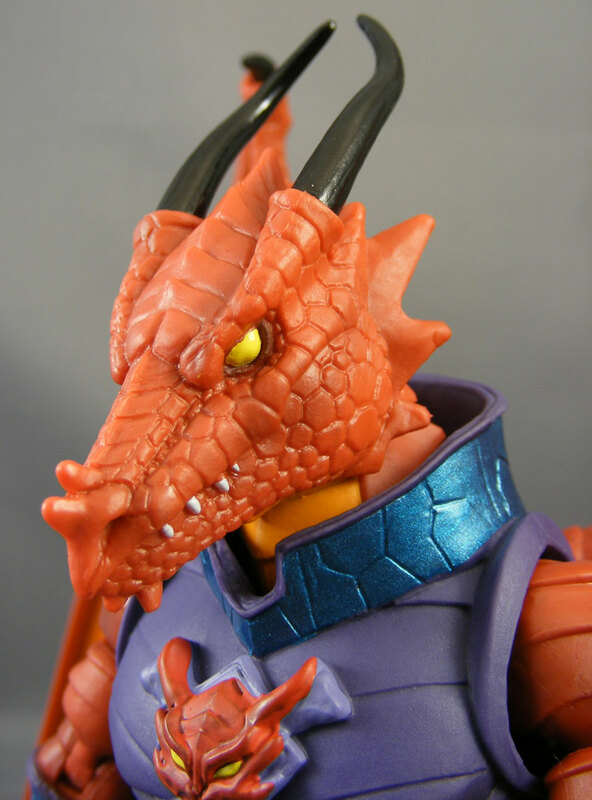 There’s more intricate detailing than on some MOTUC figures, but not so much that Draego-Man doesn’t fit in with the rest of the line. And yet, he looks almost as much like a member of the Four Horsemen’s own Seventh Kingdom as he does MOTU. 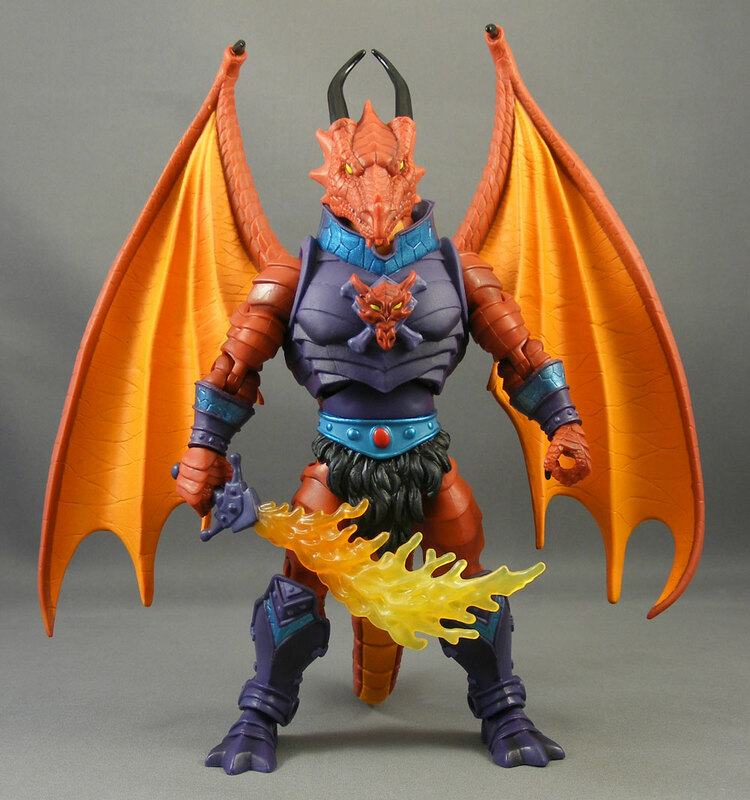 Moreover, despite the mixing and matching of parts, the final figure has an organic, cohesive look that would look fine alongside the “original eight” MOTU characters (He-Man, Man-At-Arms, Teela, Skeletor, Beast Man, Stratos, Zodac, and Mer-Man). If I have any complaint about this figure, and it’s a very minor one, it’s that I would have liked a hinged jaw or an alternate head with an open mouth. Plastic & Paint: Draego-Man has some great paint work. He’s molded primarily in red, but there’s a well-executed wash over his limbs, tail and the back of his wings. 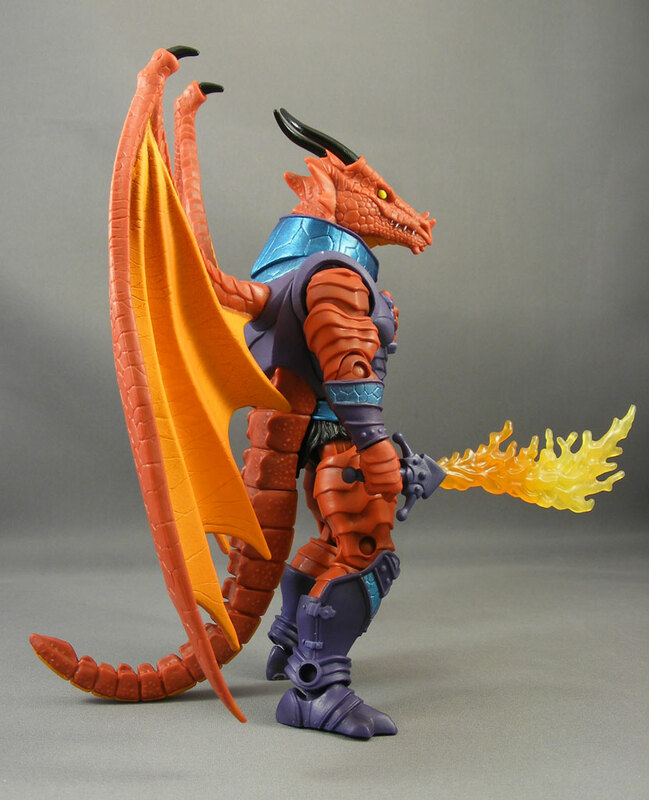 His inner wings, neck, and lower tail are highlighted in bright orange, while his armor is purple and offset by metallic blue. The paint work is a bit uneven in a few places, such as his teeth and the logo on his chest, but it’s made up for by the great work elsewhere. 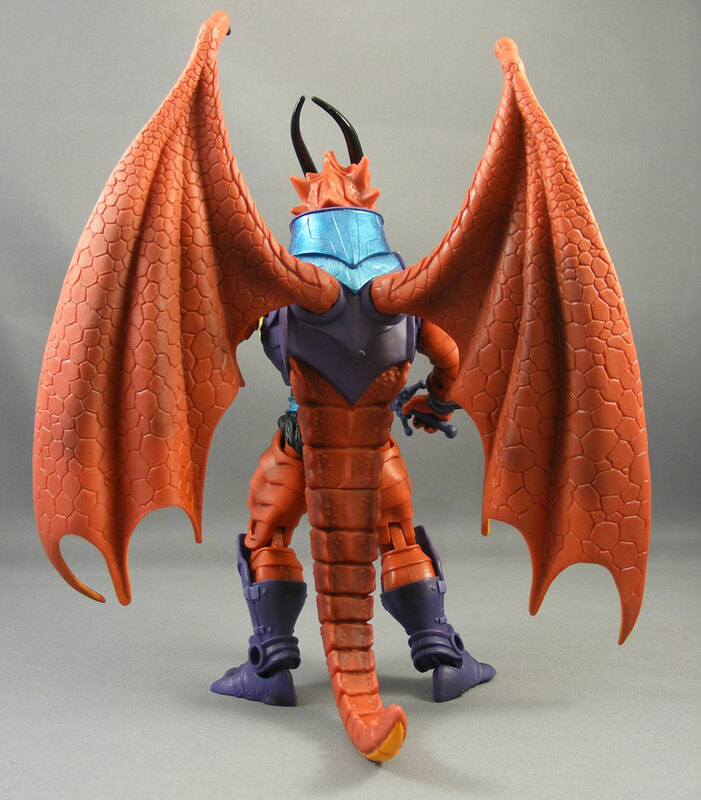 Articulation: Draego-Man features a ball-and-socket head, ball-and-hinge shoulders, ball-and-hinge wings, swivel biceps, hinged elbows, swivel wrists, hinged abdomen, swivel waist, ball-and-hinge hips, swivel thighs, swivel tail, hinged knees, swivel boot-tops, and hinged ankles with side-to-side motion as well. The ball-jointed wings are a welcome feature. 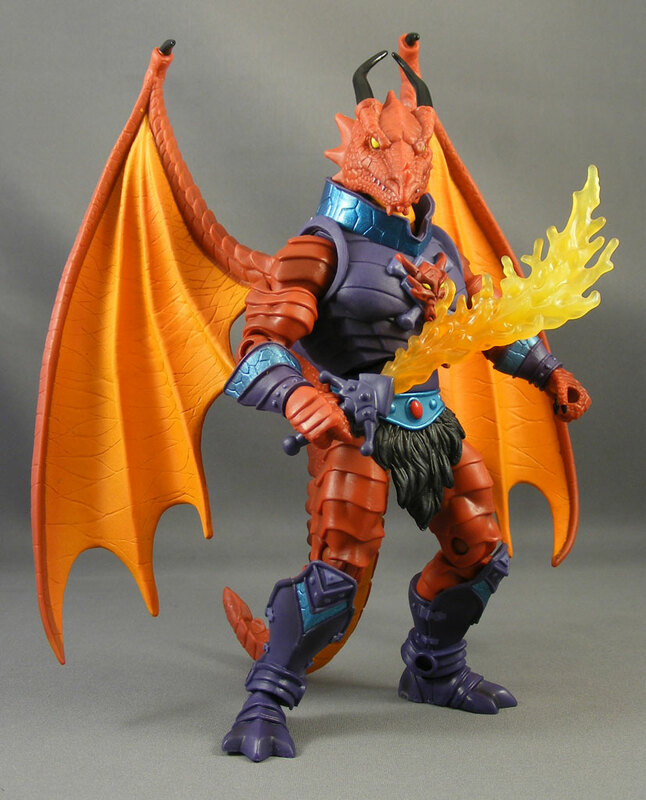 Accessories: Draego-Man was originally shown at last year’s SDCC with a purple sword, a shield with translucent flames around it, and a Balrog-style whip of flames. Sadly, none of that cost out due to all the new tooling the figure needed, and so all he gets is a flame-sword. It’s a great idea, and I suspect the original sculpt looked sharp (as the flame whip does in the previous link), not unlike Kratos’s flaming chains. But NECA (maker of Kratos) is not subject to the same safety laws as Mattel, and so in the production process Draego-Man’s flame-sword was changed into the gooey-looking Sword of Marmalade. It’s still a good accessory, but it could have looked nicer. Quality Control: My figure’s right ankle is loose; aside from that, no problems. 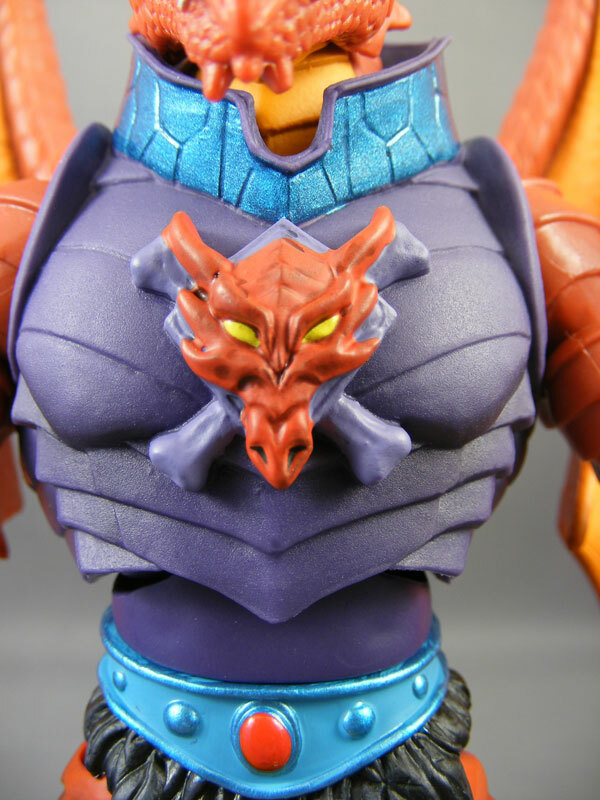 Overall: Every so often a MOTUC figure gets the works, and Draego-Man is definitely one of them. Already a fan-favorite, I’d love to see him in the DC comic this summer. It’s a well-sculpted, great-looking toy that I’ve docked a half-raven only for the missing accessories and the softened sword. 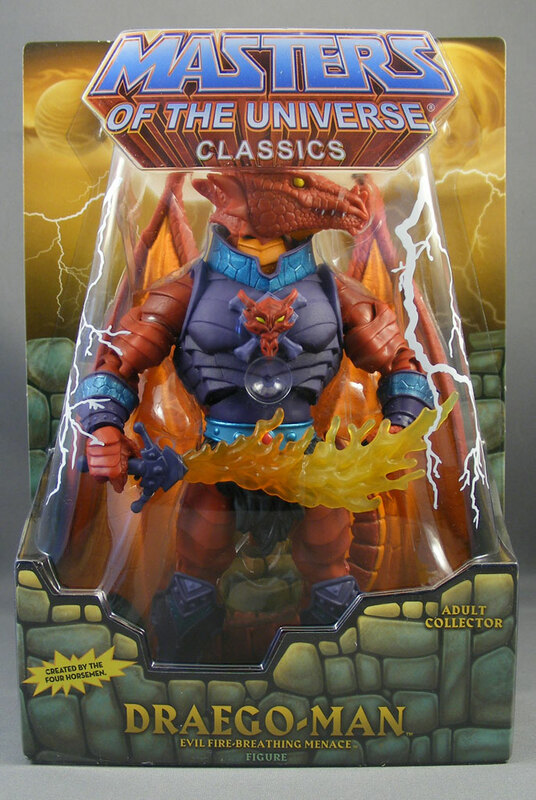 Chances are Draego-Man will pop up in a future Mattycollector sale, but BigBadToyStore currently has him in stock for $35.99. He’s also at Amazon for $34.99. 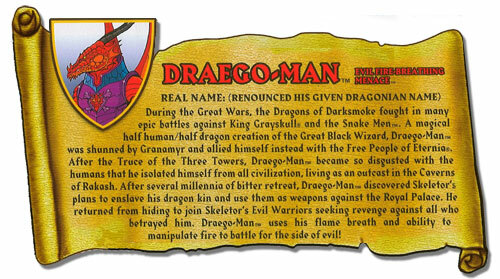 During the Great Wars, the Dragons of Darksmoke fought in many epic battles against King Grayskull® and the Snake Men™. A magical half human half dragon creation of the Great Black Wizard, Draego-Man™ was shunned by Granamyr and allied himself instead with the Free People of Eternia®. After the Truce of the Three Towers, Draego-Man™ became so disgusted with the humans that he isolated himself from all civilization, living as an outcast in the Caverns of Rakash. After several millennia of bitter retreat, Draego-Man™ discovered Skeletor’s plans to enslave his dragon kin and use them as weapons against the Royal Palace. He returned from hiding to join Skeletor’s Evil Warriors seeking revenge against all who betrayed him. Draego-Man™ uses his flame breath and ability to manipulate fire to battle for the side of evil! Happens to us with the short windows of purchase. Reminds me a bit of The Horrid, from the Spawn line. I believe the 4H did him as well. Oddly enough, I dug out my Horrid immediately after opening Draego-Man since I thought they'd look cool together! And yeah, Draego's sword is cool but the rounded edges sometimes make me imagine he's squeezing a purple juice pouch. I tell ya, even with the lessend accessories, he is really cool. Should've been one of the good guys, though, as a connection to Granamyr. This is one of those times where I have a great admiration for a figure, but strangely no desire to own it. Right there with ya. I do own it, and it is handsome to look upon, but I haven’t even opened it. Just not feelin’ it for some reason. I hate to admit it because it seems close-minded, but that may be part of it. I have a very specific cast of characters I envision when I think of the "Evil Warriors" and have had since I was a child. Draego-Man, due to the rather obvious handicap of not existing for the past 29 years, just ain't in that core group – and its a tough clique to break into! You know, I'm surprised that no review that I've read has mentioned the fact that the coloration on the final product's sword is backwards. Flames are brightest (yellow) at their source, and get dimmer (orange/red) outward from the flame's point of origin. it's like the sun's coronal layer, hotter than the surface. Huh…you're right. I didn't notice it. SIGH. this safety laws stuff is pretty tired. how does a limited, online only line with "ADULT COLLECTOR" printed very obviously on the packaging, need to meet safety standards, whereas NECA's toys can sit in all their pointy glory on TRU shelves? sounds like BS on matty's part. Mattel has safety/QC standards far more stringent than other companies. Mattel is just covering all bases in case they decide to re-release these as kid's toys. Ding! Really it’s kind of insulting to call something an “adult collector” toy and then soften it to jelly so us grown ups dont poke our eyes out. I love the little purple guy at the end! Gecko's power is vomiting uncontrollably in terror of his enemies. Since none of them want to get near his timorous, near-constant disgorgement, he has by proxy become a very successful warrior! How dare you impugn Gecko's courage! He is a mighty purple-headed warrior! Oh, gawd…I didn't even…*snarf! * Poe couldn't have possibly meant that…! He’s a great figure, but he’s not perfect. The limited neck movement make putting him in good flying pose difficult. Mine also had a crooked horn. I really was not interested in this figure until I saw some of the early reviews. Even then I talked myself into buying him about an hour after he went live. I really wish we can get our hands on his other weapons at some point in the future. Until then he gets to use battle armor Skeletors Axe, and Fisto's classic sword.